As a promised here is a more specific look at the newly announced Fears Brunswick. 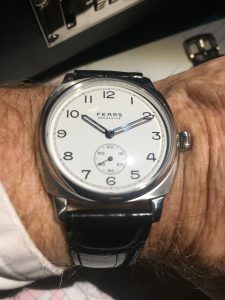 After quietly getting on with launching his reborn company around the original three watch Redcliff range and the fourth “pebble grey” variant Nicholas Bowman-Scargill has been dropping hints of a new watch since early October. Despite my questions he would not admit they would be launching a mechanical watch. I concluded therefore this years Salon QP would see the launch of a mechanical Redcliff, probably with a Swiss movement. 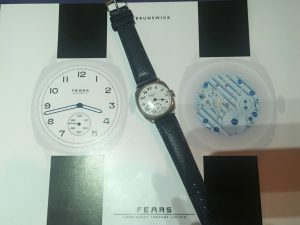 I thought this would follow the original Fears philosophy of good quality watches at a reasonable price. It was with this in mind I met Nicholas in mid-October for a catch-up and hopefully news of the new watches. 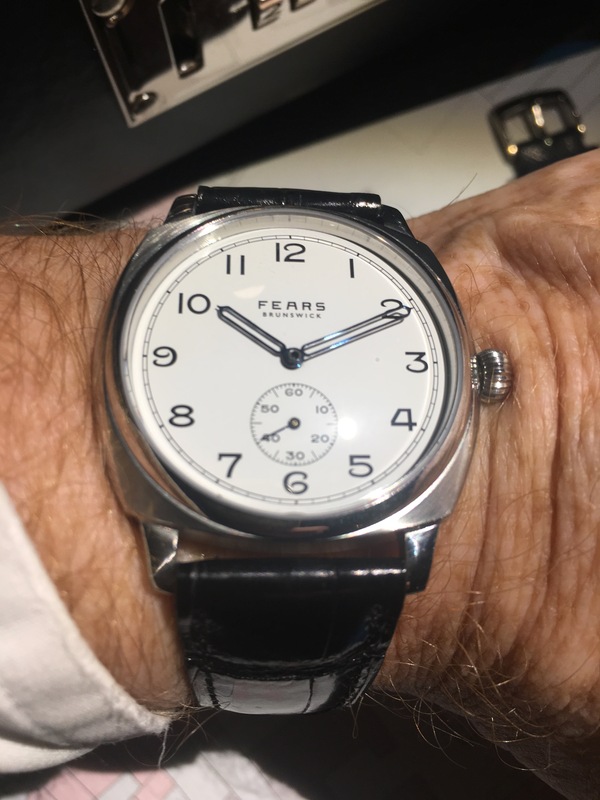 Over couple of beers and a general catch-up Nicholas then introduced me to the new watches, A “passport red” Redcliff, quartz, the Redcliff Continental, again quartz. After covering the merits of these watches as worthy additions to the Fears range came the news I had been waiting for – the mechanical watch, the Brunswick. At this point the actual prototype was not ready, but is was able to see the design. Here it is with the vintage Fears that inspired the design. What a surprise, a cushion cased, hand wound watch. But still difficult to appreciate from the drawings. I would have to wait until the “Night Before” of the Watchmakers Cub, by which time the prototype should be ready. So here it is on my wrist. As you can see the drawings did not do the actual watch justice. This is a very handsome piece that rightly was attracting compliments from everyone that saw it at the Watchmakers evening. A difficult public to win over. The top grade ETA 7001 manual wind movement is installed in a 38mm cushion case, made in the UK from 316L stainless steel. The dial is cold resin enamel, which together with the thermally blued skelton hands are also made in this country. The front glass and exhibition case back are sapphire crystal. Around the exhibition back there is enough space for engraving and buyers will also have the option to engrave the movement. The final touch of class is the strap made from calf skin tanned by Bristol company Thomas Ware & Sons. The rather un-English sounding name “Brunswick” is a reference to the address of the Fears export warehouse in Brunswick Square, Bristol. Nicholas planned an initial batch of 14 watches, this being the number of the building in Brunswick Square. However, the reception of the watch at the Salon QP has been so good this will be increased. For the moment this lovely watch is available for £1750 (inc. VAT) directly from Fears. Considering the quoted water resistance of 100m this could be the “one watch” so many people say they are looking for. Ideally for all occasions, even beach holidays if you put it on a waterproof strap, maybe a perlon.